WaterStep has helped people in more than 50 countries gain access to safe water. We currently have 96 active projects worldwide, with more in the pipeline. 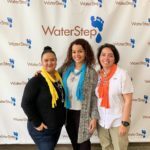 WaterStep arrived October 10 in the town of Vega Alta to provide water purification systems including M100 chlorine generators, 500-gallon bladder tanks, filters, pumps and bleachmakers and the training to operate them in 22 hard-hit and remote municipalities. The WaterStep team stayed at the Presbyterian Church in Vega Alta, its roof damaged by the storm, sleeping in tents and on camping pads in a breezeway with electricity from a generator. On the first day of training, dozens showed up from municipalities in hard-hit areas. The work continued, even after the disaster team returned home. A local representative of WaterStep continued the training and distribution of equipment, making sure that all 78 municipalities now have what is needed to take care of their own water needs. Other completed projects in the Caribbean include Haiti and Dominican Republic. Help bring safe water to Puerto Rico! of Puerto Rico had no access to clean drinking water 12 days after Hurricane Maria. Humphrey Muchuma, WaterStep Kenya and founder of Action Two Africa, is bringing safe water and health education to the Masaai people in Kajiado, Kenya. His passion was kindled when he lived in the Kiambiu slum, begging for food and shelter. It was here that he saw the need for safe water and sharing good hygiene practices. He is determined to never see a child suffer the way he did. Humphrey is a true humanitarian, married to a lovely wife and has 2 beautiful children, one who wants to be a doctor and one who wants to be an engineer. In a community where 75-80% of the children who suffered from diarrhea and parasites, safe water and hand washing has greatly reduced waterborne illness. Other completed or current projects in East Africa include Ethiopia, Madagascar, Uganda, So. Sudan, and Malawi. Help bring safe water to Kenya! Kenyans still rely on unimproved water sources, such as ponds, shallow wells and rivers. A devastating 7.8 earthquake hit the shore line of Ecuador on April 15, 2016. The deaths and injuries totaled over 29,000. WaterStep supplied the product and trained over 35 people to deploy life-saving equipment to refugee settlements. Having lost their homes, people are still displaced and WaterStep continues the work of bringing safe water to those without. On a 2017 follow up trip to Ecuador, WaterStep responded to the devastating landslides in Colombia that killed over 300 people on April 1 with hundreds missing. Other completed or current projects in Central and So. America include Costa Rica and Brazil. Help bring safe water to Ecuador & Colombia! survivors in Ecuador were relocated to shelters after the 2016 earthquake. WaterStep and their partners at Rural Health Care Foundation in Kabowa Village, are completing Phase III of a total community transformation. To date, wells have been dug, tanks have been built, WaterStep’s ChlorineGenerators have been installed, school put latrines have been built, community bath houses are in place, WaterStep’s BleachMaker is providing disinfectant and hand washing stations have been built and health education is continuously being taught. Other completed or current projects in East Africa include Kenya, Ethiopia, Madagascar, Uganda, So. Sudan, and Malawi. 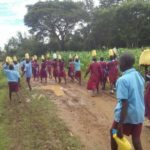 Help bring safe water to Kabowa Village! of Ugandans lack access to safe water. Families fleeing from Boko Haram insurgents are finding a home at Refugee Camps in Nigeria. WaterStep’s Nigerian partners, Victims of Violence is caring for the displaced in Nigeria. After coming to Louisville seeking help with water issues they face in the camps, they were trained and are now deploying WaterStep equipment and teaching leaders in the camps to be safe water distributors. In addition, WaterStep’s new BleachMaker is very important as it is used for disinfectant in mobile medical clinics and surgical units. We will continue to send equipment and train Nigerians to care for the over 1,000,000 displaced people. Other completed or current projects in West Africa include Ghana, Ivory Coast, Liberia, and Senegal. Help bring safe water to refugees in Nigeria! people in Nigeria are internally displaced and live in refugee camps as of December 31, 2015. Andrew Gardour and his team of 11 have jumped many hurdles to get their water project off the ground. Lack of internet (for training purposes and communication with WaterStep headquarters), lack of tanks, lack of money and now lack of rain have stalled this project many times. However, the team keeps overcoming the problems with fierce determination. 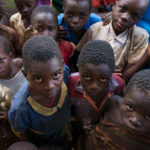 Their community assessment showed that 70% of children in this community have suffered from Cholera, a waterborne illness that can be deadly to those who are already dehydrated. When you have a lack of water you prioritize your supply and often hand washing falls to the bottom of the list. Washing hands alone can decrease the cases of diarrhea by 45%. Other completed or current projects in West Africa include Nigeria, Ghana, Ivory Coast, and Senegal. Help Bring safe water to Liberia! Liberians lack access to access to clean, safe drinking water.